Out of the 23 poorest countries in the world, 19 are located in Africa, according to an analysis by the Global Finance Magazine. Based on data from the IMF, the magazine ranked the world’s countries according to their GDP per capita and determined the poorest and richest ones. The analysis also used a Purchasing Power Parity (PPP) basis, which takes into account the living cost and inflation rates, in order to compare living standards between the different nations. Some small territories, such as Liechtenstein, Nauru, Vatican City, Monaco, San Marino and Andorra were not included in the study. The Democratic Republic of Congo (DRC) ranks in as the poorest country in the world based on its GDP per capita over the 2009-2013 period. With DRC citizens earning on average $394.25 a year, the country stands in sharp contrast with Qatar — where people earn an average of $105,091.42 a year. 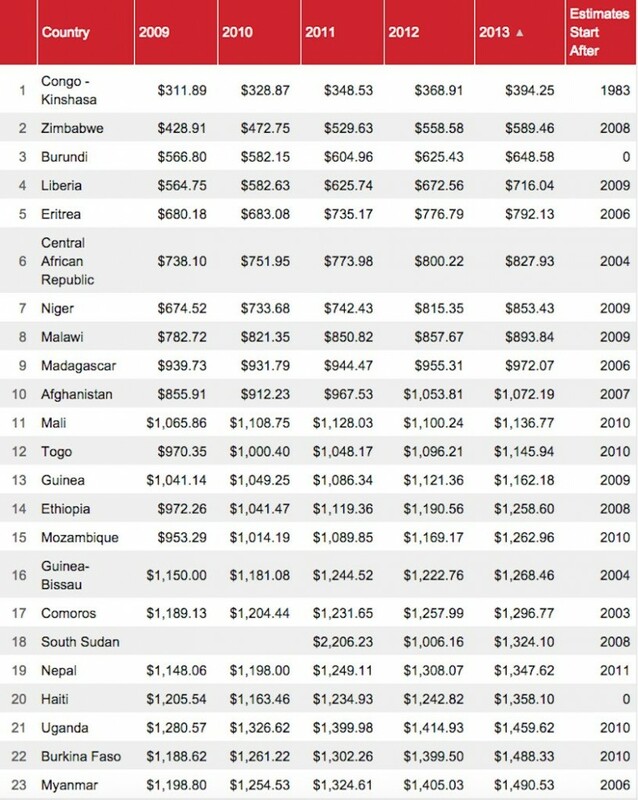 Following the Democratic Republic of Congo are Zimbabwe, where in 2013 people earned $589.25 on average, Burundi, where they earn $648.58 a year, and Liberia, where people earn $716.04 on average. The first non-African country on the list is Afghanistan, which comes in at the 10th place. It is also the first country where the average annual income passes the $1,000 threshold with $1072.19. The other non-African countries on the list of the poorest 23 countries in the world are Nepal, Haiti, and Myanmar. Author: Barbara Tasch is a news intern for Business Insider.